A few weeks ago, we started investigating the possibility of putting Linux on an XBOX. We played with some ideas in our heads, a render farm, a cheap office computer or a distributed crypto platform, just to start. The idea required a little bit of elbow grease, a mod chip, Linux and a bunch of free time. All XBOXes are locked into only booting the Microsoft BIOS. That is, if you buy a new XBOX, it's basic IO does not let you do all that much, except read DVDs, and XBOX games that have special keys encoded into them. A mod chip is a computer chip with another BIOS that physically overrides the Microsoft BIOS. Since the chip is now in charge of how the XBOX should bootstrap itself, it will allow the XBOX to recognize more discs and operations than for what the XBOX is specifically designed. Thus, backup games or entire operating systems can be loaded onto the XBOX hard drive and run from there. People have been modifying their XBOXes to run Linux for a long time now. 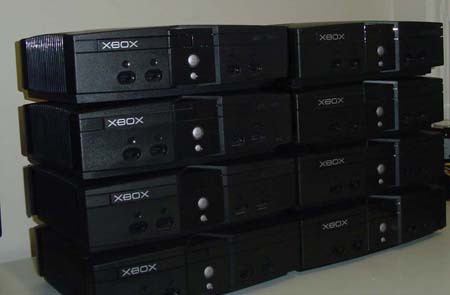 The main factor behind the XBOX modification scene sprung from some extremely gray markets that began selling mod chips for backup games. However, after several years now, the XBOX Linux community has grown very stable. XBOX runs on virtually off-the-shelf components; ergo, porting Linux to the XBOX was a no-brainer after the BIOS issue was resolved. Microsoft dropped the price of XBOXes a few months ago and BMMods approached us about the possibility of checking out Linux on an XBOX. With refurbed and used XBOXes as cheap as they have ever been right now, the stage was set for us to abuse as much XBOX as possible. The goal today is to see if we can modify an XBOX successfully to do something useful that we can't do for the cost of the modification (aside from play XBOX). We will look at a media center, a basic PC and finally, a lot at the possibility of setting our XBOXes up in some sort of cluster, with detailed steps all along the way. Simply compiling on the Opteron and Xeon with the same number of threads as the full cluster would have illustraighted a difference. Aikouka, can't you just use one of those "HD Loader" type programs WITHOUT a modchip? Halz: what should it have been? 23, yes, you can still do just about anything. I know with the software mod that I use, I've been having problems getting the original MS Dash to load up, but I've gotten around that using other programs for the original dashboard's functionality (dvd etc). You know, you can also replace the HDD with just a software mod, and it's not that hard. So, if you don't want to hardware mod and want more space, you can still put in a bigger HDD. As much as some people don't like the XBOX, in my opinion, it's probably the best console to mod. 1) what we really need is a usb-based tv tuner that actually works. That would be excellent for adding functionality both to XBoxen as cheap PVRs (though I'd still just use XBMC to stream from my ReplayTV, most of the time), but also would be great for iMacs. I'm sure if someone came up with a decent open architecture design, the community would come up with drivers for both types of systems. But first, I want to get this straight - I can mod the Xbox and still use XLink, right? I doubt I'd get a Live subscription anyway, but it'd be nice to have that option possible. Ideally I'd like to throw a bigger hard drive in there and then run XBMC, without losing the normal XBox capabilities.